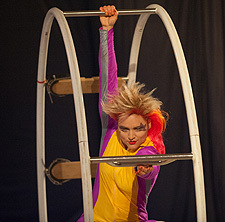 A NECCA performer unravels the puzzle of "aerial silk" movements. Some of the images for sale are in full color. This circus artist has achieved high-level skill in both contortion and balance. NECCA is delighted to announce that Jeffrey M. Lewis has generously donated a stunning collection of over two dozen framed 18"x22" full-color and black-and-white photographs of NECCA graduates and students in action, to help raise funds for NECCA's new building currently under construction. An additional 10 black-and-white prints in a smaller size are also on display and available for purchase. Some images will be paired with statements from the performers about their inspiration and motivation to learn circus skills. This special exhibit and sale will open on Gallery Walk night, Friday, April 7, at Vermont Artisan Designs, 106 Main Street, with Jeff Lewis and NECCA friends on hand from 5:00 to 7:00 p.m. The photos will be for sale throughout the exhibition, which runs through May 6. This year NECCA will move into a state-of-the-art "trapezium" building on Putney Road in Brattleboro—the newest, custom-designed circus arts trapezium in the country. Plans are to be in the new building by July 2017. The trapezium will allow year-round, indoor flying-trapeze training, as well as fabric/silk, juggling, contortion, unicycle, partner acrobatics, German wheel, teeterboard, and other disciplines—see necenterforcircusarts.org for more information on NECCA programs and performances. Charlotte Bunta, Bethan Kannapell, and Georgie Johnson team up to form a vessel and its contents, circus-style. Jeffrey Lewis has been photographing NECCA performers and performances for the last five years. He has also photographed Southern Vermont Dance Festivals, SOBO studio, and African dance. In addition to 45 years of honing his photography skills, Lewis has managed careers from ministry to economic development and is now in quasi-retirement. I was born and raised in Louisville, Kentucky, and spent my early years climbing trees, fences, walls, and people, as well as curling up into tiny spaces such as suitcases, dryers, cupboards, and crates. At age 18, I discovered circus and quickly recognized it as the ideal medium for my joy, physical potential, and artistry to coalesce. Circus also provides a means for me to honor my mother. Despite becoming blind and quadriplegic, she had more tenacity and humor than anyone I've ever known. Inspired by my mother and in an effort never to take my body for granted, I challenge myself to perform amazing feats and to create meaningful art. I believe that circus is an avenue to communicate important ideas about humanity, the environment, social justice, empowerment, and health.